It’s that time of year again. The cold winter air is starting to thaw, birds are chirping, and flowers are starting to bloom. If you’re in Korea, it’s no doubt that you will soon begin to see the pink and white blossoms of the cherry trees starting to bloom. Once they do, it’ll be hard to go more than a few steps without seeing the dazzling displays of color from the many cherry trees scattered around the city and countryside. 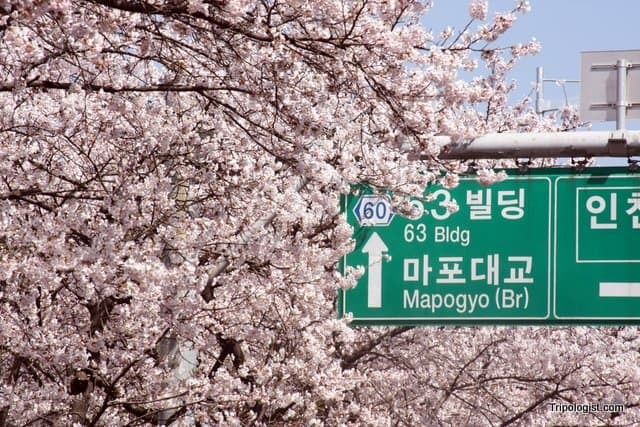 If you can’t get enough of the fluffy pink flowers, then Yeouido is the place for you. From Friday, April 1 until Sunday, April 10, the 2016 Yeouido Cherry Blossom Festival (also known as the Spring Flower Festival) will be happening on the island in Seoul’s city center. While it may not be the most peaceful place in the city for a stroll under a canopy of cherry blossoms, it’s hard to deny that beauty of the trees flanking the Han River and the National Assembly building. A canopy of cherry blossoms on Yeouido Island. The festival will feature a lot of flowers, as well as musical performances and many street vendors selling food. While not the most cultural of Korea’s festivals, it’s certainly one of the prettiest. 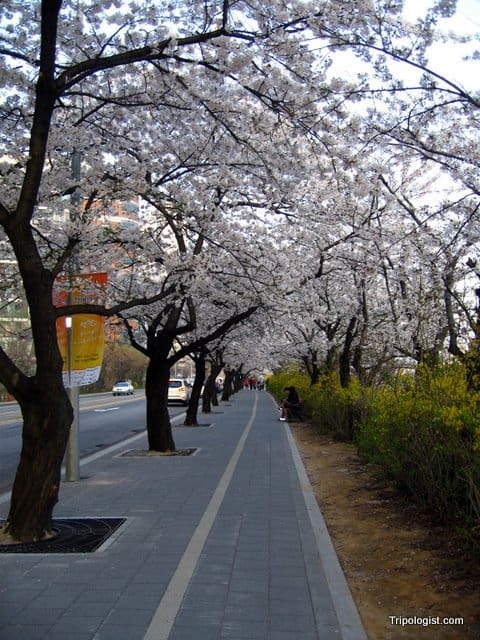 The Yeouido Cherry Blossom Festival is concentrated along the northern shores of Yeouido; however, the canopy of cherry blossoms extends for most of the circumference of the island, meaning that a stroll along the southern shores of Yeouido is sure to provide more relaxation. While it will be difficult to avoid the crowds at the festival, there are several other locations around the city that contain a plethora of cherry blossoms. City parks such as Seoul Forest or Children’s Grand Park feature a large number of budding cherry trees amid the yellows and greens of the other blossoms. You can also find your way to just about any mountain trail or quiet street in the city, as they are sure to be bathed in white and pink. Checking out the cherry blossoms this spring should be a must for anyone in Seoul. For more information on the 2016 Yeouido Cherry Blossom Festival check out Visit Korea’s website. Find somewhere great to stay in Seoul, South Korea! Great tip. Thanks for the comment. Thanks Jim! I was looking up the festival dates, and your site came up as the third or fourth result! I’m looking forward to going back to Yeouido for this in a few weeks! Glad you found the info. Hope you enjoy the festival. 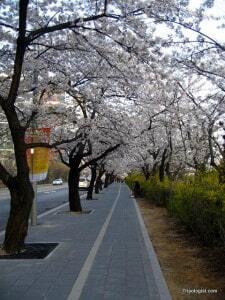 Oh I loved the Cherry Blossom Festival in Seoul. I was there two years in a row. I’ve heard there’s some kind of festival here in Beijing too, but maybe it’s not so good.